Fun is had by all! DELICIA features multiple fabulous lounge areas - the Flybridge, the Aft Deck, the Main Salon, and the Foredeck Lounge. The Flybridge is accessed with steps leading from the aft deck. The helmsman has maximum visibility from this raised steering platform which also has easy access to the sheets and running rigging. Its a great location offering space for safe operation of the yacht. There´s a spacious seating area as well as sunbathing lounge directly forward of the steering station. Of course, the view of the surrounding scenery from the Flybridge is truly delightful! The interior of the yacht, designed by the Italian specialist, Nauta Yachts, is simply gorgeous. The overall design maximizes space and adds lots of luxurious touches such as indirect lighting, a hideaway cabinet for the flat-screen TV, and clever catches for the drawers and lockers. When the sliding doors are open to the aft deck, there´s virtually no separation between the interior saloon and the exterior living area - it´s one big, open space! Last not but not least, DELICIA is a magnificent sailing yacht. Her amazing Code Zero headsail pushes the boat with a light breeze to a speed faster than that of the wind, to her guests´ delight! WIFI connections can be arranged with a local provider in BVI for $20 per person per week, although mainly for checking emails and not sufficient to stream movies. Suggest download movies at home before charter. Clients can also purchase a local SIM card with data cover for around $50- $100 depending on package required. Send us an inquiry to get specific pricing for Delicia. Captain George and Patricia were fabulous and I would recommend them to anyone! They were friendly, flexible, and pleasant. 12/29/18 to 1/5/19 - Fabulous!! Yes! They had a FABULOUS time. I spoke to my client several times via email while he was onboard! Below, I have cut and pasted what my client had to say this morning. Tracy, I wanted to report back that Captain George and Patricia were fabulous and I would recommend them to anyone. They were friendly, flexible, and pleasant. The Delicia was a bit small for 4 couples and 2 crew, but it worked fine. We appreciate your work to place us together. In one word: Perfect! It was the perfect mix of romantic, relaxation, and adventure! Was the crew professional, congenial, and accommodating? Even without factoring in the fact that Sylvie and Caroline had very short notice that they would be our crew, they were both extremely accommodating and fun! Sylvie was very flexible in determining our plans for the trip, and she always started the day by presenting Laura and I with several options for what we could do. Additionally, they were both very in tune with Laura´s and my desires. They left us alone when we wanted to be alone, and were very sociable and fun when we wanted to hang out with them! We never once felt uncomfortable or intrusive. The yacht was as clean and well-maintained as it could reasonably be expected to be, given the last minute crew change and whatnot. There were a few minor issues - some missing cushions for the front seating area, a broken cabinet or two - but these were completely out of the control of Sylvie and Caroline and really had no effect on our enjoyment. How did you find the quality and presentation of the meals? Exquisite. Caroline is quite an accomplished chef. Laura documented each of our meals on the boat because they were so good! The coconut chicken was Laura´s favorite, and mine was the fresh mahi mahi. Breakfast and lunch were always very good as well. When we left the yacht, I commented to Laura that it seemed as though every time I was just getting hungry, Caroline had a snack or a meal ready for us without me even having to ask. Please let me know if there´s anything else you need from us. Thanks for everything! Now that Collin and I are back home in the states, I wanted to send you those pictures we took on the boat! And I also wanted to express again how grateful we are to you for making our honeymoon so fantastic. And Sylvie, you knew exactly where to take us snorkeling and to the best, most beautiful beaches and towns in St. Martin and St. Barth´s. We went to Kakao beach club at Orient Beach when we were on St. Martin and asked if your husband was there, but sadly he wasn´t working that day. But, we had a great day and lunch there anyway! Caroline, I hope you saved that iguana and that he is now your pet. Haha! ´Everything went great. Dylan and Chelsea were superb, the Yacht was nice. So a very happy ending. Please thank Dylan and Chelsea for me. 11-18 March, 2017 ~ BVI ~ Grateful!! It is rare to find two individuals whose personal passions and commitment to their profession intersect so seamlessly. Your love for what you do permeates everything you do for your guests, both as a team and as individuals and is nothing less than infectious. You have taken a family unsure if chartering a catamaran was a good idea, and leaving them unable to fathom never taking a trip like this again especially one that doesn´t include the both of you! So thank you both for sharing your passions with us. For reminding us of the value of time and of taking it to take a moment to just breathe, to not only be thankful but grateful to feel the wind in your hair, sun on your face and to lay back and just stare at the stars. 25 Feb - 3 March, 2017 ~ BVI ~ - Lifelong Friends!! Back home after another wonderful trip. Delicia is a very nice boat and was very well maintained and provided us with plenty of comfort and space for relaxing, sailing and enjoying plenty of time in the sun. The crew was absolutely fantastic. Upon first meeting Dylan, we knew immediately we had a great Captain for our trip. He is extremely professional and knowledgeable and when you hear about his experiences sailing, you know you are in good hands. He was very cautious and responsible and goes out of his way to make sure you feel comfortable on the boat. He was great with making suggestions on places to go and very flexible and accommodating with our itinerary. Chelsea is also extremely professional and put us right at ease from the moment we were stepped on board. She is a great cook and we loved every one of her meals. She was very mindful of our specific food requests and helpful each time she accompanied us on shore. Soon into our trip, we found that on top of all the hard work they were doing to make our trip enjoyable, they are both super sweet, friendly and fun to be around. We all loved learning more about their country and their past adventures and quickly considered them part of our group. To say we were all sad to say good-bye would be an understatement. I would absolutely recommend Dylan and Chelsea as the crew for anyone considering a charter. They helped us make memories we will never forget and well always consider them friends. Please be sure to share our feedback with the owner. He has a great boat and the best crew he could ask for. Dylan and Chelsea take great care of Delicia and their guests! February 4-11, 2017 ~ BVI ~ Absolutely Perfect! My name is Doug and myself and four other couples have just come from a week long charter on Delicia. I am writing to you to let you know just what a wonderful crew Dylan and Chelsea are! They went out of their way to make sure our time on Delicia was absolutely perfect! They took the time to get to know us and to understand our likes and dislikes. And were able to form the most spectacular itinerary from that. And were more than willing and able to adjust that itinerary once we were underway as they got to know us even more. They both have a wonderful knowledge of the BVI´s. And Chelsea has a wonderful cook! They became like family to us which made us all want to stay on the boat even longer. We will definitely charter with Dylan and Chelsea again! I can´t say enough about how wonderful of an experience we had with the two of them! This was our second charter and it surpassed even my greatest expectations! 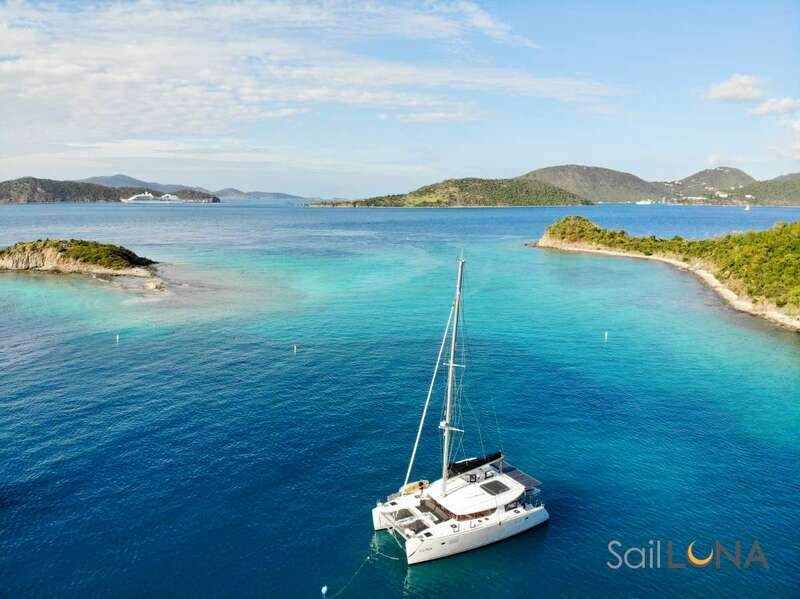 We just got back from a lovely cruise in the BVI´s on Delicia. We had an amazing time. Dylan is friendly, easy going and safety conscience. Chelsea is friendly, funny, and attentive. Delicia is beautiful! It´s a trip I will cherish and honestly want to press the rewind button and do it all over again! Just a quick note to say thank you very much for all you did to help make our charter the wonderful experience that was! You helped steer me to the right captain and crew and definitely the right boat. I can´t thank you enough for all that you did that lead us to the perfect boat and crew. Dylan and Chelsea are without a doubt the best captain and crew in the BVI´s! They went out of their way to get to know us understand our likes and or dislikes and to suggest changes the itinerary as we went along to make our trip even more memorable. They became like family to us and we all hated to leave the boat that last day. We will definitely book another charter and will definitely insist on Dylan and Chelsea being our captain and crew. His knowledge of the area and his knowledge of the boat are beyond compare. He is probably one of the most levelheaded even keeled responsible people I have ever met. Chelsea is just an all-around wonderful person! Who makes you feel right at home the first minute you meet her. Her skills on the boat and in the galley are incredible. She and Dylan work together like a well oiled machine. They are a fun loving wonderful team who work together very very well! I would highly suggest that you put them at the top of your list of captain and crew for customers who want the best interaction with their captain and crew that they could ever ask for. February 4-11, 2017 ~ Fantastic!! My wife Kim and I sailed the week of 2-4 through 2-11. I just wanted to tell you what a wonderful time we had. Dillon was a great Captain and a huge source of information. I learned something new everyday. Chelsea was a fantastic chef and shared many hilarious stories. Indeed, one of the best vacations we have been on. I only have rave reviews for Delecia and Captain Dylan and Chef Chelsea!! First off the Delecia is a beautiful catamaran, nicely kept, clean and had all the amenities. Captain Dylan was an amazing captain, hung out with us, brought us to the most amazing beaches. Extremely knowledgeable, accommodating, and always looking out for our best interests. Chef Chelsea whipped up the most amazing meals. Not sure how she did it in such tight corners, but the food was healthy, delicious and creative! November 12 - 19, 2016 ~BVI~ Tons of Fun! May 6-13 2016 ~ Bahamas ~ Best Trip Ever! It was a perfect trip! The captain Javier, works very hard and professionally, as well as Marie. The crew was amazing, the food and drinks excellent, the itinerary perfect. The fishing and snorkeling were wonderful. The yacht is new and very comfortable for 8 people. This was the best trip ever for my friends and I, and the entire experience of our trip was outstanding! We will be back soon. We had a fantastic time aboard the Delicia! The boat was very nice and very well taken care of! Everything was extremely clean and ship shape! But the best part was the crew! Kevin and Sally were delightful, extremely nice and very very accommodating. They really tried to tend to our every wish. They were incredibly friendly and nice companions in tight living quarters. Sally did a great job of cooking and being the first mate. The food was very very good. We had requested a more simple Mediterranean sort of menu and she did everything to completely accommodate our wishes, and all was delicious, especially the wonderful breakfasts.Nothing like having your coffee topped up without even asking! Both she and Kevin eagerly served the food and made sure we were totally satisfied. Most importantly however was the skippering by Kevin. He is obviously very very knowledgeable on sailing and we felt safe and secure always with him at the helm. He was completely competent and knew all about the islands, boating, weather and all that had to do with being on the water. He very expertly and impressively parallel parked our vessel in-between the Rutters catamaran and a huge yacht to the amazement of all on the docks for our New Years Eve dockage. He was given kudos from all the other captains. He would not have attempted it but the yacht club insisted that was the only space for us. He was a totally trustworthy captain and both he and Sally were honest and earnest people of exceptional character and temperament. We would love to sail with them again anytime! Thank you for a most incredible week in the BVI. You made us feel like family and you took such great care to make us so very comfortable onboard! The food was delicious and the skippering superb! Your expertise in yachting made our trip the best ever! We loved your company and all the comforts of Delicia. Thank you for being so accommodating to every last wish. You all were truly a dream crew! Wishing you all the very best on all of your journeys! We will miss you! This is a selection of dishes we can prepare. It can change subject to season and availability. We can also create a meal plan based on the needs and preferences of our guests. Tea, Coffee, Milk, Orange Juice, Yogurt, Granola, Cereals, French toast.